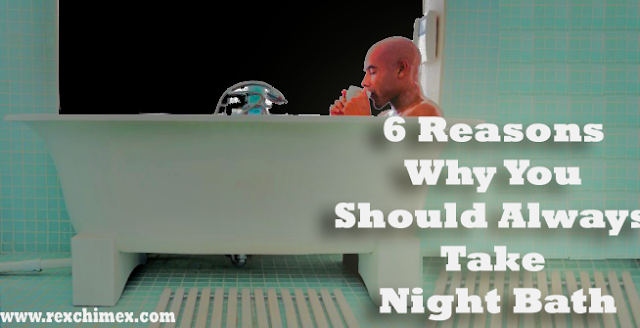 Here are Six reasons why you should take night bath. Sometimes you can get too tired and getting a warm bath in the night can be something you don’t look forward to. Research from the journal complementary Therapies in Medicine found that soaking in warm water daily for eight weeks is more effective at easing anxiety than a prescription drug. Here are many reasons you should have a soak in the evenings. Many of us tend to put the air conditioner on and then the sheets get cool and comfy. But this triggers a drop in your body temperature, and that shift signals the body to produce melatonin, which induces sleep. That’s why taking a warm bath before going to bed is a good call, it temporarily raises your body temperature, after which it gradually lowers in the cooler air, cueing your body to feel sleepy. Sage sharpens memory, and bergamot relieves stress, according to journal alternative and Complementary Therapies. After a hectic day, a warm bath helps bring back sanity to the ever-hardworking brain. It’s well-known that every day, we move out to from our homes to our various place of work or appointment. We prepare ourselves and apply so many substances. The ladies apply so many creams, perfumes, etc. to look awesome! Also on our way out, and at our work places we might come in contact with so many substances of chemical nature, which might attack our skin. We can only remove all those substances from our skin once we have our night bath. Sleeping with all those substances on our skin can alter the skin pH and cause unwanted skin reactions. When the skin pores are blocked due to substances that are deposited on our skin without our knowledge. Acnes can arise, because blocked skin pores lead to the accumulation of opportunistic bacteria’s in our skin. This bacteria’s can infect the hair follicles and lead to sudden appearance of pimples or acne. Therefore night warm bath can help decimate bacterial activities in the skin.